A Little Diamond: Slide Rock Will Give You a Big Wedgie. Alternate Post Title: A Beautiful Day for a Birthday! 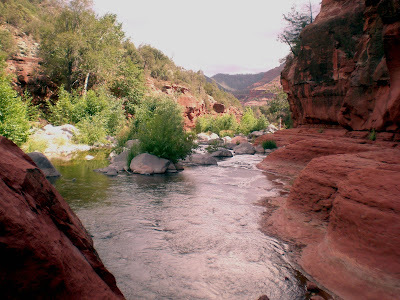 My ex-roommate Laura planned a trip to Slide Rock near Sedona for her birthday. It was a beautiful day as you can see! We slid down the natural water slide, though I took no photos of that part of the adventure. 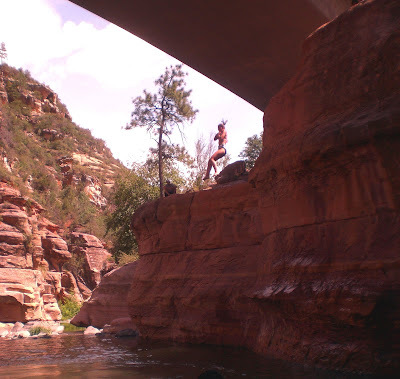 We jumped off varying sizes of cliffs, of which I took many photos. Since the sky was a clear blue, we teased Laura for worrying about the isolated thunderstorms that she said were in the forecast. We stopped teasing her when the thunder and lightning started. This is Brad doing flips off the low cliff. He's pretty agile. The girl in the photo is responsible for this post title. After she jumped off the cliff she loudly proclaimed "That gave me a big wedgie!" Indiana Jones? Nope, just Craig jumping off the high cliff. I definitely did NOT attempt this one. It took Laura a long time to build up her courage to jump, but she did it! She entered the water pretty much in the same position as she is here in midair. She got bruises on the backs of her thighs. I am not regretting my decision to pass this up. We hiked further up the creek. It really was a beautiful day and a beautiful location! I love this photo. The thunderstorms were rolling in, but the sun was still shining. 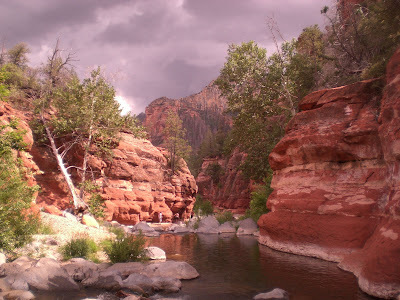 It was starting to rain as we took the obligatory "leaving Slide Rock" photo. I love summer rain in Arizona - it was a perfect end to a perfect day. Click this picture to see the full album. I love the God shots. Beautiful. I can get a wedgie without having to jump a cliff. I'm that talented! The pic with the boys aint bad either! Come to think of it, I've never been to slide rock.